Budgies are among of the most popular parrot species that people keep as pets and is especially loved for their playful and sweet character. The budgie parrots come from Australia and live in big flocks in fields, in open bushy, woodsy and agricultural land areas, with tall trees like acacias and eucalyptus, with special preference places where is water nearby. The name Budgerigar which means “good food”, derived from the indigenous inhabitants who used them as snacks. The healthy budgie birds stand out from their vivid look, their clean mucus beak, their spotless feet, their bright and even plumage. Birds that appear to have bumps in their plumage should not be chosen for purchase, since they will definitely have health issues. The diversity they seem to have with the spectaculars colors of their plumage, makes them especially attractive. The color that dominates in their plumage is blue in all of its shades, green, yellow, or even white, with a distinctive white or yellow crown and spotted whiskers. Their size isn’t bigger than 18 centimeters including their long tails. 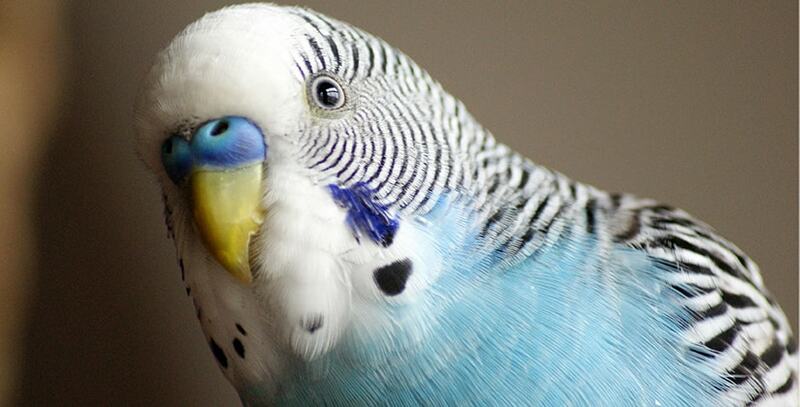 The male budgie stands out from the female in the color of their cere (fleshy covering, which is located above the beak), which is blueish purple for the males, while it’s creamy gray for the females. Their beak is greyish brown, while their feet are either gray or flesh colored. The male budgie parrots have a milder and sweeter character while the female ones are a little more crancky and aggresive. Males hardly ever peck hard and never with the intension of hurting someone, while females in contrast, have a very strong bite and they can hurt anyone who tries to mess with them, with their small but sharp beak, especially if they’re not familiar with them. The Budgerigar parrots are significantly tender in their relationships. They are able to spend countless hours looking after each other, feeding each other, and even fondling-scratching with their beaks. They can not even resist their owner’s petting, especially if they’re petting them on the head with their forefinger. They show their appreciation for petting by raising their head’s plumage and turning sideways. The budgie parrots take care of their plumage daily, rubbing special fat from uropygial gland on it, to keep it shiny and even. They babble endlessly, especially if they are a couple, while if they are alone, they need daily care from their owner. They can be tamed relatively fast, but they speak rarely. The Budgerigar parrot is considered to be an easy bird to handle and is recommended for amateurs who want to have a cute, social and playful bird at home. It is necessary for its pleasant and long life to go buy the right cage that will accomodate our parrot. Ideal is considered a robust constructed and painted with non toxic colors cage, which is also preferably tall, with horizontal rails. Spaciousness and the right layout of the feeders and the perches are essential, in order to exist enough free space for the parrot to climb on the rails, to exercise its feathers and to have various toys that are designated especially for these birds. Common parrots love the swing, which is considered a necessary accessory of the cage. The Budgerigar’s cage must be placed in a bright and airy spot, protected from the dangerous air steams though, while it is essential for their health to be seen by the sun for at least some hours. It is needed to clean not only the base of the cage, which should be covered with litter, but the perches and the kit for food and water must be kept clean and neat all the time as well, to avoid various diseases and infections by bacteria. The use of paper on the bottom of the cage should be avoided because they have the tendency to rip it to pieces with their beak. They love water and they like bathing or being soaked, especially in the very hot summer days. Some plants that can be toxic and harm irreparable their health. Be careful if there are other pets in the house like cats, dogs etc. Exposed and open aquariums or toilets or buckets with a lot of water, that could drown them. Burners that are on or pots that are boiling could lead your bird to a sudden death. To assure their health for the years they’ll be our companion, we must provide them a proper and balanced diet. Except for the basic seed mix which contains a variety of seeds, a basic supplement in the diet of the budgies are fresh vegetables and fruits. Their favorite fruits are bananas, apples, strawberries, grapes, melons, kiwis, blackberries, pineapples, while they also love lettuce, broccoli and shredded carrots. The deficiency of certain vitamins from their diet can lead to many problems. The right presentation of the food is important too. Many times they hesitate to try new tastes but you need to be patient and persistent. Because they also need animal protein they can even try ants and hard boiled eggs. Some even prefer dairy products like yogurt or cheese, while others don’t. Some Budgerigar parrots try new tastes with ease, while others stay reluctant for a long time until they decide to try them. What should definitely be avoided in their diet are avocados, chocolate, onions, and very sweet or salty or spicy flavors. Budgerigars must be older than 8 months to reproduce. They prefer closed wooden nests, that they fill either with woodchip or with pieces of paper. The female budgie gives birth in spring to 4-5 eggs, per every other day, which she incubates for 17 days. In that period of time she becomes overprotective with the eggs and the hatched chicks subsequently, she doesn’t hesitate to attack the male who becomes very jealous and many times tries to harm the chicks. Newborns are fed by their mother for 35 days. Their life expectancy can get close to 8 years.